A couple of weeks ago, hundreds of us Independent Stampin' Up! demos met together for our bi-annual corporate event called On Stage. One of the features of this event is recognition of those demos who have done particularly well with Stampin' Up! over the past year. And I'm so happy to report that my upline, Caroline, of CraftyCarolineCreates, was recognised for being in the top 5 UK demonstrators in all three categories of Sales, Recruitment and Leadership and was ranked at number 83 in the Global 100. Such wonderful achievements and I wanted to make an extra special card to recognise her achievements. My card was inspired by samples I had seen on Pinterest by other demos - namely Julie Kettlewell and Joanne James - thank you ladies for your inspiration! It was very tricky to get a photo that does justice to the card as it is so long but narrow. 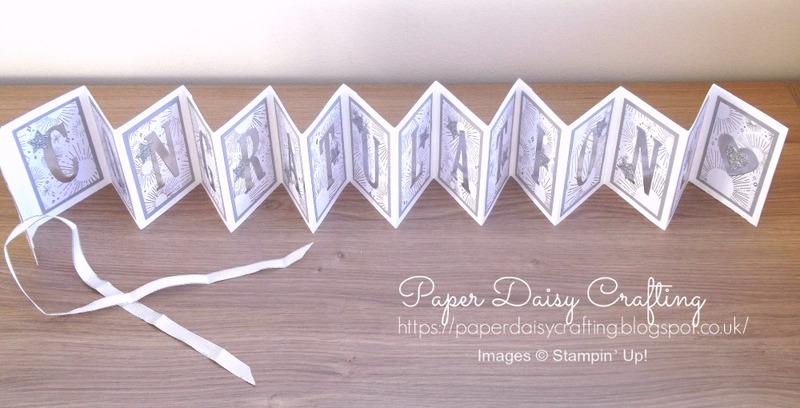 It is a concertina card with 17 panels! The next photo might give a better view - taken at a slightly different angle! As you can see, once again I have used the Large Letter dies. I know that these are a considered purchase but I have used them so much they have repaid my investment many times over. Maybe they could go on your Christmas wish list? I had such fun making this card and my head is buzzing with all kinds of other occasions it could be adapted for - watch this space for my Christmas version coming soon! You will also need one more panel in the same cardstock measuring 3 3/4 ins x 2 3/4 ins. In "Bundle of Love" DSP, 17 panels measuring 2 ins x 3 ins. The small panel for the front of the card measures 7/8 in x 3 1/4 ins in Crumb Cake and 5/8 in x 3 ins in DSP. Of course I forgot to take a photo of the Very Vanilla and Gold card when it was closed and secured with ribbon before I sent it off to its recipient (doh!) but here is the one I made on the video which is much the same except different colours. 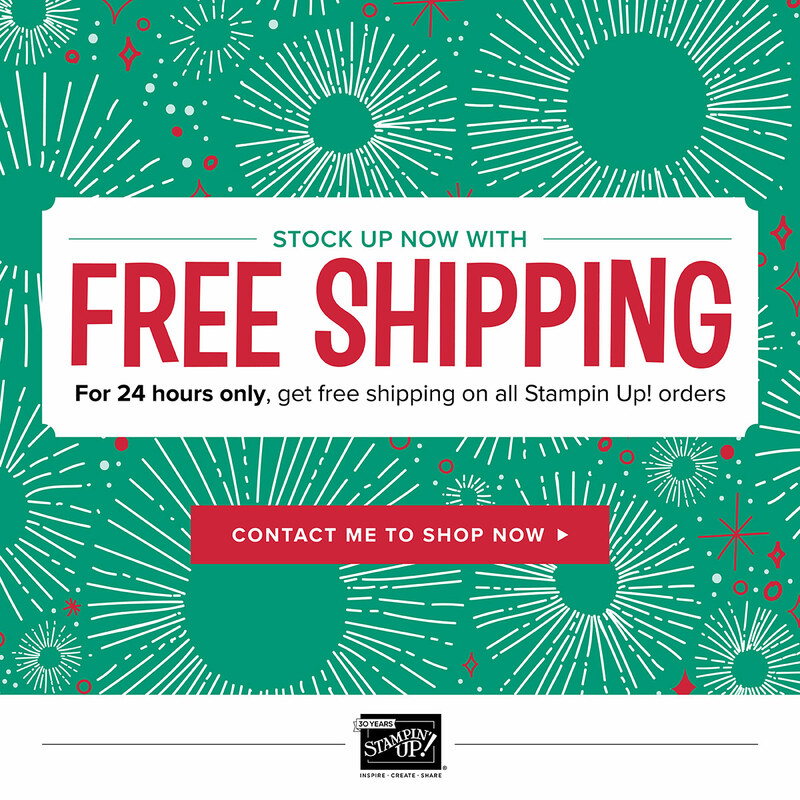 And don't forget that today for one day only, until 10.59pm, Stampin' Up! 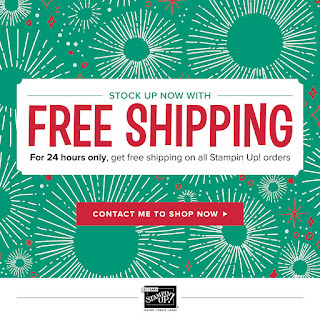 are offering FREE shipping on all orders.